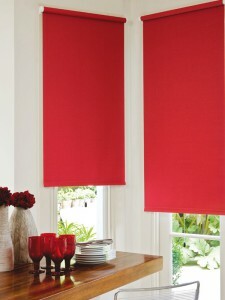 Holland Blinds Blackout, also known as Roller Blinds, are an extremely popular and modern blind, suitable for all homes. Holland Blinds are a practical blind for everyday use, Blockouts, Sun Screens and Translucent with a metal or plastic chain available, that operates the blind through an aluminium tube to roll up and down. 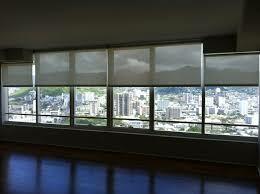 Roller blinds are also available in motorized systems where the blind is controlled by a remote control. The Roller blind comes standard with an anodized silver colour base rail along the bottom of the blind with matching end caps. The base rail is also available in your own choice of colour and fabric. With matching brackets and side winders, the Roller Holland blind is available to fit inside or outside of your architraves, or on the outside of them, depending on what suits each home. If you have a Screen & Blockout on one window frame, you have the option of putting the two blinds on a double bracket, inside the window, or you may choose to have one inside you architrave and one outside your architrave. 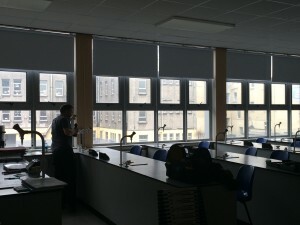 This gives you the modern feel, as you can have two blinds showing at once. With our large range of fabrics and colours, we have the design for any home. 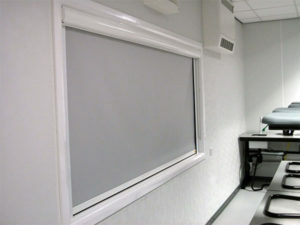 You also have the choice of adding a Pelmet to the Holland Blind, which covers the roll of the Blind. These are available in selected colours, or with the same fabric as your blind wrapped around the pelmet. Blackout Roller Blinds with Tracks and Cassette. Tracked Roller Blinds give you complete Blackout, the blind material runs up and down the tracks stopping the light entering the room. These blinds are perfect for those who awake easily to light entering the room.